Controlled Photomosaic Map of Callisto. 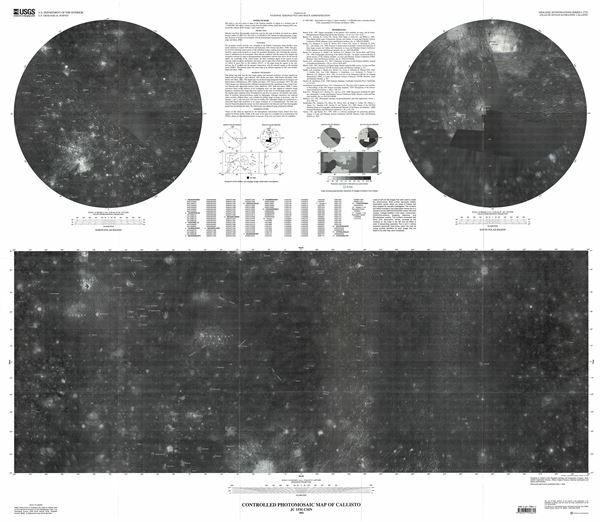 This is a beautiful 2002 example of the U. S. Geological Survey map or photomosaic of Callisto, the moon of the planet Jupiter. This map of the third largest moon in our Solar System was compiled from images from the Voyager 1 and 2 space crafts. The map identifies Valhalla, the Solar System's largest multi-ring crater basin. The Asgard formation, the second largest multi-ring structure, is also shown in this map. The North Polar Region and the South Polar Region are represented in two insets in the upper left and right quadrants respectively. This map was prepared for the National Aeronautics and Space Administration and published by the U.S. Geological Survey as Geological Investigations Series Atlas of Jovian Satellites map I-2770. Geologic Investigations Series. U.S. Department of the Interior. U.S. Geological Survey.